The aim of 'ggplot2' is to aid in visual data investigations. This focus has led to a lack of facilities for composing specialised plots. 'ggforce' aims to be a collection of mainly new stats and geoms that fills this gap. All additional functionality is aimed to come through the official extension system so using 'ggforce' should be a stable experience. ggforce is a package aimed at providing missing functionality to ggplot2 through the extension system introduced with ggplot2 v2.0.0. Broadly speaking ggplot2 has been aimed primarily at explorative data visualization in order to investigate the data at hand, and less at providing utilities for composing custom plots a la D3.js. ggforce is mainly an attempt to address these “shortcoming” (design choices might be a better description). The goal is to provide a repository of geoms, stats, etc. 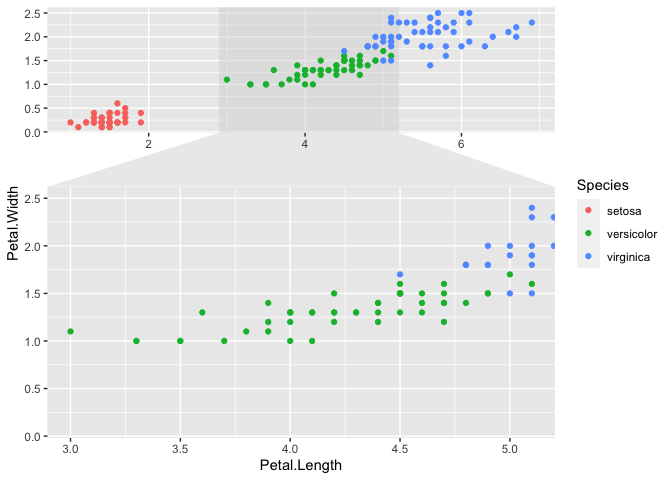 that are as well documented and implemented as the official ones found in ggplot2. geom_voronoi_[tile|segment], geom_delaunay_[tile|segment|segment2], and stat_delvor_summary has been added for tesselation and triangulation. Add geom_diagonal, geom_diagonal_wide and geom_parallel_sets for drawing parallel sets diagrams and other visualizations based on diagonals. Add geom_shape for drawing polygons with rounded corners and expanded/contracted sides. geom_shape replaces all geom_polygon internally. The *2 versions of line geoms no longer adds an NA to guides.